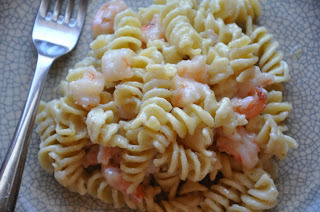 Guest blogger, Rachel Joyce, gave weheartmacandcheese.com permission to repost her inventive Shrimp Macaroni and Cheese recipe. If you'd like to check out more recipes from Rachel, visit her blog at www.laptopsandstovetops.com. Here in Orlando it has been unseasonably, abnormally, abhorrently cold. Usually, the cold is considered "cute" in this region of the country. It's fun for a little while to play dress-up in sweaters and knit hats, but soon, after the holidays are over, the nostalgia wears off. Floridians expect sunshine and warmth and lots of it. But this year, thanks to that imaginary problem know as "global warming," and Punxsutawney Phil's ill sense of humor, the wintry weather has lasted well into March. This is a true abomination for the sunshine state. Still, we must soldier on. A great way to fight the oppressive wind chill factor is to cook luscious, hot, comfort food. I recommend a heaping helping of my Shrimp Macaroni & Cheese. Chock full of sinful ingredients i.e. fresh shrimp, fontinella cheese, cheddar cheese, and Rotelle pasta, this recipe is a snap to cook. It is destined to become your go-to dish for hot, ooey-gooey, cheese and pasta goodness. There is one 'trick' to keep in mind when making this dish; cook the shrimp directly in the cheese sauce. Um, Heaven! Prepare 1 1/2 cup shredded white cheddar and 1 cup Fontinella.Shell, de-vein, and chop each shrimp into 2-3 piece. Bring water to a boil in a medium pot for the 1/2 lb of Rotelle pasta. Once the water boils, add the Rotelle and cook until al dente. In a large sauce pan, over medium heat, melt 1 tbl of olive oil and 1 tbl of butter together. Once the butter is totally melted, add 1 1/2 tbl flour and whisk it into the butter and oil mixture. Whisk the mixture and cook together for 3 minutes. Add the shrimp and season it with salt, black pepper, and freshly grated nutmeg. Slowly, add the cream to the pan and and whisk it in with the other ingredients. Let the mixture bubble and cook until thickened; about 7 minutes. Add the shredded cheese and begin to mix it in . Turn the heat off and continue to mix until its melted smoothly. Taste and season with more salt, pepper, and fresh grated nutmeg as needed. Drain the Rotelle and shake out the excess moisture. Add the pasta to the cheese and shrimp sauce in the pan and mix the two together. This is a very yummy and rich recipe. The next time I make it I will probably use half and half instead of cream.